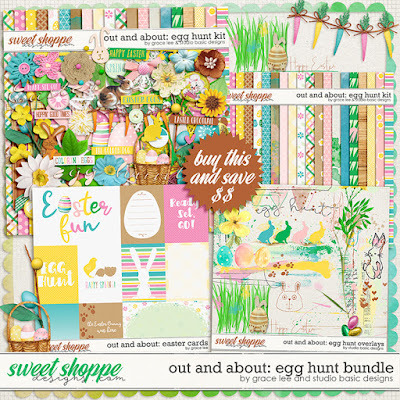 Out and About: Egg Hunt Bundle with Studio Basic Designs is hopping into Spring with a a gorgeous Easter theme. Bunnies, eggs, and flowers, will make documenting and creating fabulous layouts of egg hunts, gardening, filled Easter baskets, and other family fun a breeze! and 90 elements. The elements included are: 2 banners, 2 baskets, 1 beads, 3 borders, 3 bows, 2 branches, 3 bunnies, 4 buttons, 1 clothes pin, 1 Easter candy, 1 Easter grass, 4 eggs, 2 ephemera, 4 flair, 14 flowers, 4 foliage, 1 frame, 1 grass, 3 hearts, 6 labels, 1 leaf, 1 pompom, 1 nest, 1 paw prints, 5 ribbons, 2 strings, 1 tag, 4 titles, 2 trim, and 10 word art.